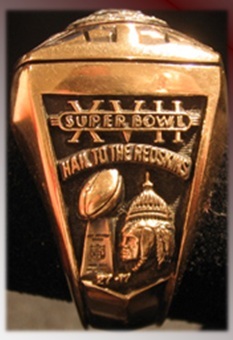 Riggo and Riggonomics powered the Redskins to the Super Bowl XVII title with a 27-17 victory over the Miami Dolphins in Pasadena’s Rose Bowl. 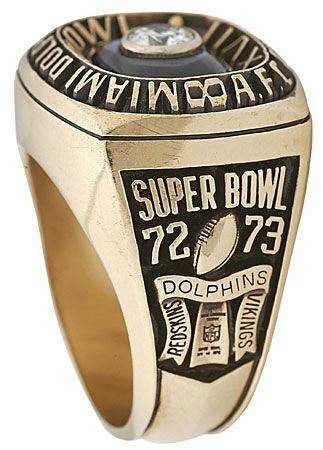 For winning the AFC Championship of 1982, this is the ring the Dolphins received. In an era where the Dolphins were known as “Wood-Strock”, for the penchant of playing veteran backup Don Strock for starter David Woodley, I found it ironic that Coach Shula didn’t pull the trigger and put Strock in during the second half of Super Bowl XVII. The Dolphins offense could only complete one pass along with an interception over the final 30 minutes of that ball game. He had the same penchant as he was developing David Woodley in the early 80s. Remember the “Epic In Miami” the year before? Shula pulled Woodley in the second quarter when the Chargers built a 24-0 lead. Why did he not pull the trigger in Super Bowl XVII? In fact the Dolphins defense was in its prime and wanted to make amends for that 41-38 playoff loss to the Chargers. They came through the 1982 strike shortened season as a top flight defense earning the nickname “the Killer B’s” ranking #1 in the league. As fate would have it the Dolphins hosted San Diego again in the playoffs. The Chargers had just ended Terry Bradshaw’s career with a playoff win in Pittsburgh. Miami won easily 34-13. This game was the catalyst in turning the tide in moving Miami into the conference’s elite while the “Air Coryell” run ended that day. The Chargers wouldn’t return to the playoffs the rest of the decade where Miami was on the rise. 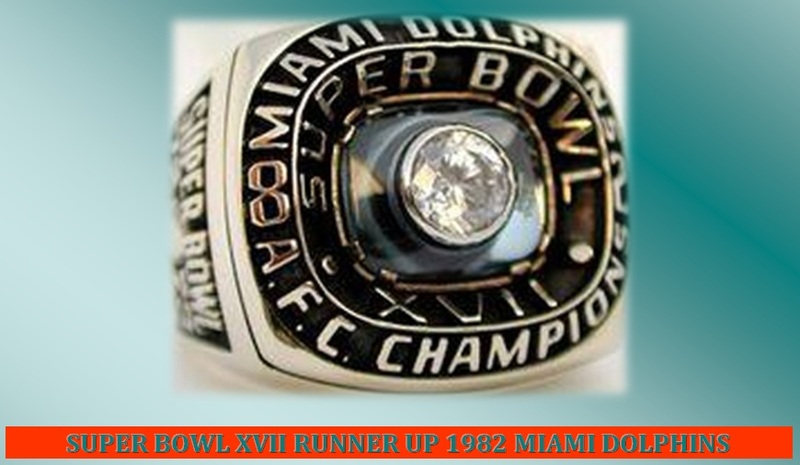 Appearing in 3 AFC title games over the next 4 years, the first being the ’82 AFC Championship. That game was played in a torrential downpour in the Orange Bowl. 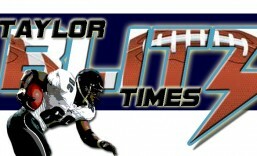 In the mud “the Killer B’s” shut out Richard Todd, Freeman McNeil and the high powered Jets offense 14-0. A.J. Duhe had a career game with an AFC Championship record 3 interceptions, returning the last for the decisive touchdown. Although the Dolphins offense started off well in the Super Bowl, they were wasting a good performance by the “Killer B’s”. It took the famous Riggins 43 yd touchdown run with 10 minutes left in the game to take a 20-17 lead. They also came within inches of a deflected Kim Bokamper interception for a touchdown that would have strategically put the Dolphins in position to win the game minutes before. The Redskins possessed the football for nearly 20 minutes in the second half. Woodley only completed 1 pass in the second half. Maybe Shula felt they didn’t have enough time with the football to turn it over to Don Strock. Hindsight is 20/20 but wasn’t the reason Coach Shula replaced Woodley back in the San Diego game based on his ability to throw the ball and get hot in a hurry? I’m still puzzled by Shula not making the switch. Well maybe Don Shula saved his best quarterback replacement job for last. After this anemic offensive performance in the Super Bowl he drafted Dan Marino a few months later. Maybe Don Shula knew what he was doing. Hail to the Redskins: Really? 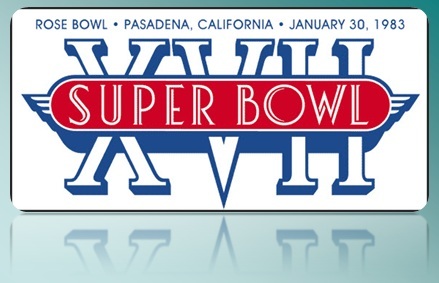 David Woodley can’t complete ANY passes in the second half of Super Bowl XVII for Miami?? None?? Ok he completed two in the second half, 1 to his team and an interception to Redskins S (present Green Bay Packers President & CEO) Mark Murphy and wasted a decent effort by the “Killer B’s” defense. However the Super Bowl win by Washington was a throwback to old fashioned grind it out football with Riggins for 4, Riggins for 3, Riggins for 5, and wearing down the defense. However, when I see this ring it takes me back to two weeks prior. I can remember being fired up for the NFC Championship between Washington and Dallas and knew it was going to be a thing of beauty. It actually started when the Redskins were putting the finishing touches on a 21-7 win over the Vikings to set up the NFC Conference final when the chant “We want Dallas!! We want Dallas! !” resonated from the jam packed crowd at RFK. Just moments before John Riggins, who had rushed for 185 yard was in the midst of a curtain, turned and gave a bow to the crowd sending them into a frenzy. Those sights and sounds reverberated throughout the stadium and CBS chose instead of showing the final plays of the game, panoramic views of the raucous fans. It became a part of the story. Beginning with Dexter Manley professing that he “hated Dallas” on Monday of championship week that got the ball rolling. It was all over ESPN… Then came the back and forth in the newspaper from Danny White of the Cowboys, to Redskin owner Jack Kent Cooke, everyone was stoking the fire. How bad did it get? There was even a heated argument about the game within the House of Representatives the Friday before the game between Texas and Washington delegates where the late Thomas “Tip” O’Neill adjourned session an hour early. It was on!! Over a football game? Yes over a football game. The hating of Dallas really grew wings in the George Allen era in the early 70’s. He preached it, lived it, and hated the treatment America’s Team received as a media darling. It kept breeding hatred within their division rivals. 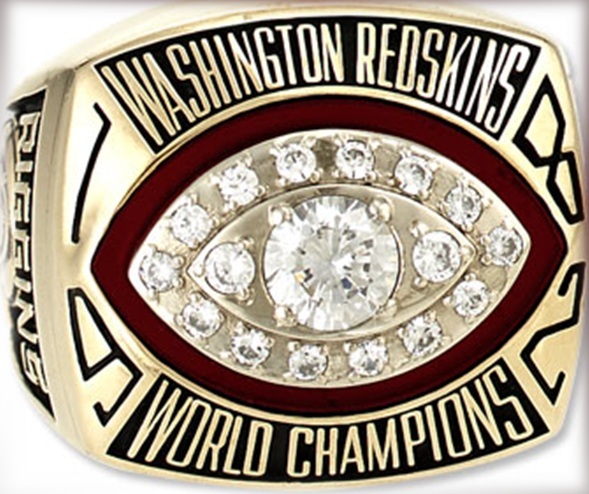 Old time Redskin fans still talk with high regard of the fact that they beat Dallas in the ’72 NFC Championship when the Cowboys were defending champions. So here we were some 10 years later and all that animosity was a thing of the past right? After all new owner, new coach, new quarterback and cast of characters comprised the Redskins roster. Right? I still get chills thinking about that because kickoff was 30 minutes away and the crowd at RFK began another “We want Dallas!” chant. It wasn’t as boisterous as the one from a week prior but it stoked the fire. How must that have felt for the Cowboys to come out to shaking stands and all that noise during warm-ups let alone what would they hear on 3rd downs?? The Redskins weren’t a taunting team but they talked big before that game during the week and on the field pregame. Near fights broke out….couldn’t have been better set up. So what happened? Remember Dexter Manley? Well he knocked Danny White out of the game with a concussion very early and forced Gary Hogeboom to finish a championship game he was ill prepared for. Then clinging to a 24-17 4th qtr lead and the Cowboys having seized momentum, Manley struck again. On a screen pass the hard charging Manley blew by the Cowboy tackle and as Hogeboom tried to float a screen to Dorsett, Manley tipped the pass that DT Darryl Grant took back 20 yards for the final TD to seal Dallas’ fate 31-17. The entire team was in the endzone celebrating that touchdown…hadn’t seen that before. So Joe Gibbs, Theismann, Riggo, The Hogs, & The Fun Bunch played a spirited game and here is a video recount of it. This article is dedicated in the memory of former Washington Redskin owner Jack Kent Cooke and the late George Allen. This is the most wonderful time of they year!! Spare me that Christmas talk…lol We were taught old lessons and had some performances remind us that the league is ever evolving and new stars will emerge. As for the Jets and the Colts? We knew this is who the Jets had retooled to beat and they won. Peyton Manning needs more options. I had said all along that their pedestrian receiving corp would come back to haunt them and they did. Eventually those receivers would see better corner back play and teams were clamping down on them starting in last year’s playoffs. The Jets came back with one more corner in Antonio Cromartie. Who would have thought that his biggest contribution would be from forced kick return duty. Lets face it, had that been a kick return to the 20, Sanchez would have had to complete 4-5 passes when there was already less than a minute to play. With the way he’d been off with his passes up to that point??? Ehhhh… luckily he only had to complete a few.